I have had multiple different jobs while in music school, and I can say I’m happy to work while a music student. I’m not one of those people who can live music from morning until night. I need a break, and a part time job is a great outlet for me. Ideally, you would want a music job, but there are some unrelated jobs that are great, too. Don’t be ashamed if you have to work while you’re in school. If you make the most of your job, you might even graduate with an advantage over your peers. Do you have to work in music school? Working in music school is up to you. Some people have to work for financial reasons or simply because they need to stay busy. Other people can’t work because they already have enough on their plate from music school. I worked part time during most of my time in undergrad. I had a part time food service job during my freshman year and the first semester of my sophomore year. Then, I took a year and a half off from working. My senior year, I worked as an opinion writer for my university’s student newspaper. If you need to have time to decompress, then it might be worth it to not work. However, if you don’t have enough financial support from family or student aid, you might have to work a few hours each week. What are the best jobs for music majors? If you do decide to work, you need a job that will work with your schedule as a music student. Yes, you want to have enough money to pay for necessities, but you’re there to learn. You are in music school to improve your playing. The best jobs for music school students are flexible. If you can, an on campus job is great for this. On campus jobs understand that you’re a student, and they understand your schedule. They know that certain times of the semester where students will have to prioritize schoolwork. Off campus jobs don’t always understand that you’re a student. You should definitely disclose your student status to any job you apply for, but they aren’t obligated to follow your schedule like on campus jobs. Certain online or home based jobs are also good options for music majors. These jobs are flexible, and you can take on as much or as little work as you can. I work for an online content agency, and yes, I do work from home. If you can’t tell from this blog, I love writing almost as much as music. I’m a freelance content writer, and I also have projects in the works for this blog. Soon, I do hope to start teaching private lessons, either in person or online. There are many jobs for music school students from music jobs to food service to other unrelated gigs. The best jobs for music school students are flexible and low stress. Here are a few job ideas for music majors. Teaching private lessons is a pretty obvious job for music school students. You can teach lessons almost anywhere from your home to online to students’ homes. If you live on campus or in an apartment, I would recommend not teaching out of your home. Many cities and towns have at least one music store that also offers music lessons. If you don’t have a reliable place to teach, contact these stores to see if they need someone to teach your instrument. You can also start marketing yourself around campus and around town. If you’re open to online lessons, then you can market your services on social media or your website. If your school has openings for student jobs in the music department, you’re in luck! The exact openings will depend on your school, but some jobs include administrative assistant, stage manager, recording technician, and ensemble librarian. Some schools require that student workers qualify for a Work Study to apply for these programs. If you’re interested in one of these jobs, ask around to see what’s open and how to apply. Graduate students can also apply for a graduate assistantship. These positions are more intensive than other student jobs, but they also pay more. One of the jobs I had in undergrad was for the student paper. I worked as an opinion writer, which was perfect for me. I just had one 30 minute meeting each week where the editorial staff discussed potential pieces and assignments. After the meeting, I had two or three days to write the piece I was given. The pieces were short, so it took me less than an hour to write these pieces. If opinions aren’t your style, there are other parts to a newspaper that you can work for. See if your school hires and pays its student writers, and you might have a super flexible job on your hands. Aside from the music department and student paper, there are plenty of on campus jobs you can apply for. Schools need students to work anywhere from the cafeteria to the bookstore. While food service isn’t the most glamorous job, it’s convenient and flexible. You can also work in your school’s bookstore. This is a great way to avoid food, and you might even have downtime to work on some homework. Other great on campus jobs include resident assistant and reception center assistant. Being a resident assistant isn’t for everyone, and it does take up a lot of time. However, it does usually come with free room and board. If you want to work in student housing but not as a resident assistant, then consider working at the reception desk for student housing. Housing complexes need people to take in mail and packages, help with room lockouts, and more. Bring some homework for late nights and other slow periods. There are tons of jobs for music school students, but the best ones work with your schedule and are worth your time. If you can only get to a job for a few hours a week, it might not be worth taking. That’s what makes on campus jobs a great option. I worked through most of my undergrad, and I’m working part time through my masters. There’s nothing wrong with having to work a bit during school, but you can’t forget why you’re there: music! 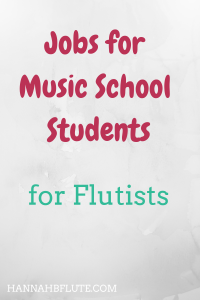 Have you worked as a music school student? Let me know in the comments! Previous Previous post: Why Music?